Let’s be solid as a rock: Commitment and experience can lay a firm foundation. Many of us, growing up, never heard of Soroptimist, yet we struggled on for opportunities to make more of our lives and we gained experience. Life is sometimes likened to being “hard as a rock”: but this difficulty/hardness has given us a foundation from which we can now say: we know. Throughout our lives, we were sometimes able to let those who mentored us know our appreciation; other times we couldn’t. Now, we have an opportunity to help others receive a supported experience: Soroptimist – best for women. In our endeavors, let’s be solid as a rock; let’s be committed to what we say we represent. For we know that when some rocks are cut and polished, they take on a different look: they no longer are ordinary looking, but become beautiful. Soroptimist – let’s be best for women. Thank you to all of our members for a wonderful and productive year. It has flown by and we have accomplished a lot! Looking back at our first function – it was a “hands-on” day hosted by Donnasue. Several members gathered to make Thanksgiving cards which I delivered to Foothill Village. We enjoyed a fun afternoon getting “crafty” and creative. Next came our 20th Teddy Bear Tea. We all enjoyed a lovely afternoon watching the smiles of all the children and adults in attendance. Our food and entertainers were terrific. Thanks to all our members for all their hard work. For the Murphys Open House parade in December, Sheila provided a beautifully decorated truck for SICC. It was a cold night but for those of us in attendance, we had a lot of fun. 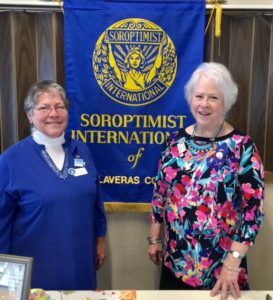 Soroptimist’s ARE visible in Calaveras County! Our first Sip & Paint event was an exciting and profitable event. Thank you, Billie, for heading this up. It is amazing to me how one painting can take on so many different creative looks. Cannot wait for the next one! February is “Heart Health Month” and we, again, sponsored cholesterol screening for any woman in Calaveras County. Our partner for many years, Dignity Health, deserves a huge thank you for allowing us to offer this service to so many women. The Irish Days Parade in Murphys was our next chance to give Soroptimists of Calaveras County more visibility. Thank you to Sheila, Chyrl and all in attendance. “Kick Up Your Heels” – a women’s celebration of friendship was a wonderful afternoon of gourmet appetizers, local wine and getting to know each other a little better. It went way beyond my expectations. I hope we can make this an annual event. Thank you to all who invited prospective members and guests. All of the appetizers showed a real commitment to a fun new Soroptimist event. Our annual Awards Banquet held at Murphys Hotel was a very special evening. Our Violet Richardson awardee was Emily Smith, a senior at Calaveras High School. Our Live Your Dream Award recipient was Debbie Richards who will further her educational goals. The highlight of the evening was recognizing Ginger Duffy as our Ruby Award winner. We had a lovely evening surrounded by many guests; wonderful food and special friendships were made or remade. 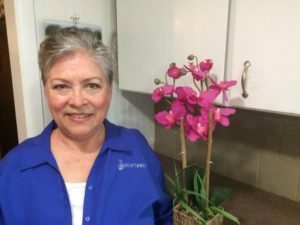 Paulette headed up our Chili Cookoff this year along with Chyrl and Karen Strand turning this event into a huge success. Terrific chili, enthusiastic cookers, good music and lots of hard work by all our members, once again, paid off. Thank you all. Finally, we had our first Destination Raffle. Headed by Carol T. and myself, we enjoyed many days of walking the streets of Murphys and Angels Camp asking for donations. Not one person said “No” and we ended up with four wonderful destination packages to raffle. Our members came through again, selling and buying raffle tickets, which resulted in a profit of almost $2,000 in 6 weeks! Together we have accomplished a lot this year and I am very grateful to each and everyone of you for your help in improving the lives of women and girls in our community.